• Our dietary supplement ‘Gamma E Tocopherols’ is formulated using four forms of vitamin E. There are actually eight different forms of this vitamin – four tocotrienols and four tocopherols. 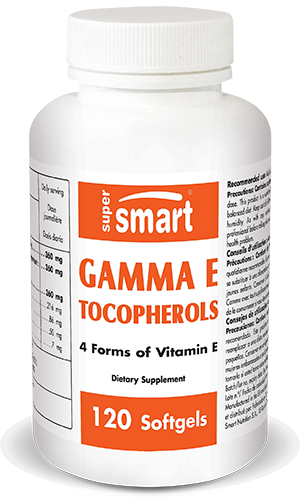 Our product ‘Gamma E’ contains the four tocopherols: alpha-, beta-, gamma- and delta-tocopherol. Alpha-tocopherol is the most important form for human health; it is easily absorbed and accumulated in the body. • The composition of our ‘Gamma E Tocopherols’ represents a valuable source of vitamin E. Discovered during the 20th century, vitamin E is a fat-soluble vitamin which is essential for normal bodily function. Like all vitamins, it is involved in many processes in the body, though it has a particular role in providing antioxidant protection. While it is found primarily in vegetable oils and nuts, dietary vitamin E intake can sometimes be inadequate, potentially leading to deficiency. Lack of vitamin E manifests as a burning sensation and pain in the hands and feet. If it is not diagnosed early, vitamin E deficiency can lead to complications such as neuromuscular and retinal problems or immune system disorders. Supplementation may thus prove necessary to restore the body’s vitamin E levels. • Generally less well-known than vitamin C, vitamin E has nonetheless been the subject of numerous scientific studies, as reported in the journal Nutranews. As with vitamin C, studies attribute vitamin E with antioxidant power and the ability to prevent free radical damage and the effects of oxidative stress, thus delaying cellular ageing. By inhibiting the oxidation of certain cells, vitamin E may also prevent the development of some diseases. Other research has focused on the vitamin’s anti-inflammatory, anti-platelet and vasodilatory properties. Not all the effects of vitamin E have yet been fully explained. • While many vitamin E supplements contain the alpha-tocopherol form, our product has been specially formulated to also include three other forms. Of these, gamma-tocopherol is currently the most widely-studied because of its potential neuroprotective effects. Indeed, some results suggest it inhibits a free radical called peroxynitrite, an element which is potentially harmful to neurons. Based on the latest scientific research, our product ‘Gamma E Tocopherols’ is offered in the form of a softgel, at a suggested dose of one softgel a day. This dosage can be adjusted in line with your therapist’s advice. adults. Take one softgel a day, or as advised by your therapist. To ensure an intake of all the beneficial forms of vitamin E, as well as related forms (tocotrienols) at optimal levels, we recommend also taking one softgel of Annato Tocotrienols a day.